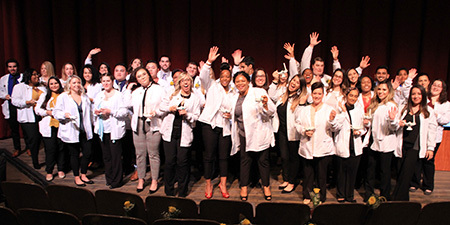 West Windsor, N.J. – Several years of intensive academic and clinical preparation paid off on Jan. 15, as 40 Nursing students from Mercer County Community College (MCCC) were conferred their A.S. degrees during the program’s Pinning Ceremony. It was one of the largest classes in recent years and included nine male students. The night began with congratulatory remarks by MCCC President Dr. Jianping Wang and Dr. J. Brandon Shaw, Vice President of Academic Affairs. The graduates’ next step is to take the National Council Licensure Examination (NCLEX-RN). Over the past few years, Mercer’s pass rate on the NCLEX-RN exam has been over 90 percent. Shaw challenged the group to surpass	that	number. "You	have what it takes to reach 100 percent," he told the graduates to claps and cheers. Arias said that her Mercer experience was everything she was looking for, including a challenging curriculum, a schedule that allowed her to take classes at night, and credits that will transfer to a B.S.N. program. Six students were singled out for special awards. In addition to Arias, who earned the Academic Excellence Award, other awardees included: Yashirie Benitez (Clinical Excellence), Rudra Singh (Professionalism), Isa Martinez (Caring), Bethany Duncan (Perseverance), and Shaiful Ali (Teamwork). 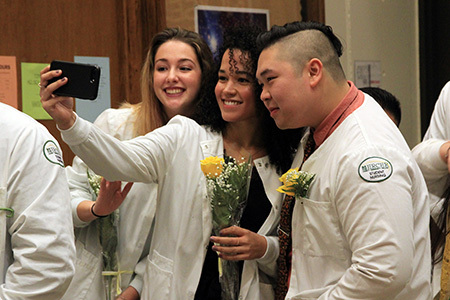 Three students, Aira, Alisson Rodriguez and Stephanie Evans, were inducted into MCCC's Epsilon Rho Chapter of Alpha Delta Nu, the national nursing honor society, whose mission is to promote scholarship and academic excellence. 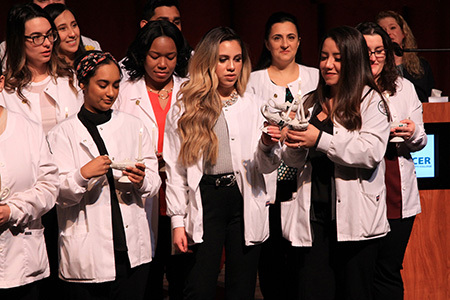 After graduates received their pins, Director of Nursing Elizabeth Mizerek distributed their "Lamps of Learning" and led them in the Nightingale Pledge, named for the celebrated nurse Florence Nightingale. “These lamps symbolize the enlightenment and knowledge that will help you nurture that spark into a healthy flame,” Mizerek told the class. 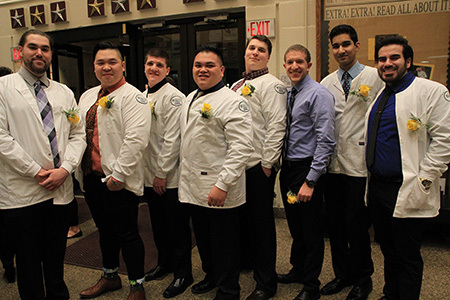 View highlights from the Pinning Ceremony on Mercer's YouTube channel here. 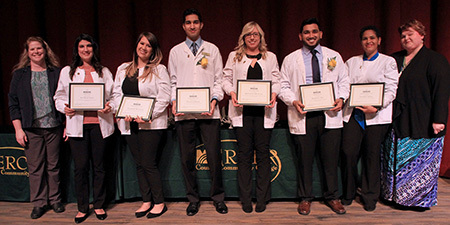 Students receiving awards included, second from left to right, Isa Martinez (Caring Award); Yashirie Benitez (Clinical Excellence Award); Rudra Singh (Professionalism Award); Bethany Duncan (Perseverance Award); Shaiful Ali (Teamwork Award); and Naykis Arias (Academic Excellence Award). They are pictured with Director of Nursing Liz Mizerek, far left, and Nursing faculty member Florence Lee, far right. Lamps were lit as part of the Nightingale Pledge portion of the ceremony. Happy members of the graduating class, from left, Brenna Massey, Jenna Maxwell and John Adriel Ng.